We took Sprout to soccer camp last week. I’m pretty sure he didn’t learn a single thing about the sport, but it was the best money we spent all summer. As I’ve discussed with some of you already, watching 3 and 4 year olds “learn” to play soccer is hilarious. All of us parents just set up our chairs along the sidelines and tried to hold in our laughter as the coach attempted to herd squirrels teach. And the kids? Well, they compared shin guards, picked their noses, watched the clouds, and – on rare occasion – paid attention. – The coach was from the UK. Probably a very accomplished athlete and soccer star, but the kids didn’t care one bit about that. Instead, they spent 20 minutes asking why he was talking funny. – The next opportunity Sprout got with the ball, he was doing a beautiful job dribbling it towards the goal. We were all getting excited that there was some semblance of a soccer game going on! Anticipation was building…then he stopped mid-dribble to pick a clover and walked right off the field to deliver the flower to me. I woke up this morning still reeling from the difficulty of last night. Sprout woke up as his usual, cheerful self – a testament to how much more resilient he is than I’ll ever be. A few hours later I got a call from a number I didn’t recognize. Uncharacteristically, I answered it. It turned out to be a woman who I exchanged numbers with a couple months ago at a foster parent seminar. Out of the blue she got the urge to follow-up and give me a call. Can you believe her timing? We sat and talked like old friends; she told me stories about the many children who have been through her home and I told her about the heartbreak in mine. She commiserated, reassured, and gave me perspective I was lacking. And thanks to her following a whim, I found myself back on my feet again. Everyday miracles…they happen, well, every day. I believe in rehabilitation. I believe that people can change and should always be given the opportunity to do so. I believe in my role as a foster parent and the goal of reunification. But tonight, oh Lord tonight, all my beliefs have been tested. And then it all came to a head when they were dropped off. Two hysterical sobbing masses left at my doorstep. Rosebud was soothed with a change, a warm bottle, and a couple of sweet lullabies. But when you are 4 it’s not that easy – you remember too much. You understand too much. So I collapsed with him on the kitchen floor. I clenched my eyes and rocked that sweet boy as he cried his heart out. He cried a darker pain than I’ve ever known despite having 7x the years he does. I whispered to him because I knew that if I were any louder, he’d crumble right there in my arms. A while later I carried him to his bed and made up stories of spaceships and water slides to breathe into his ear. An attempt to transport him far, far away. Even just now when I left him, he still trembled as he drifted into sleep. Please help me remember what part of this is right. All those peaceful and easy nights when she was itty bitty are kicking us in the tuchus right now. Teething is going to be the death of us all. Think I’m being dramatic? You should have heard the screaming last night…in fact, did you? We are working with Sprout on building some healthy independence. Granted, a few months back we were spending hours in a therapist’s office working on building attachment, but according to our therapist, you can’t have one without the other. So, here we are. I hand Sprout his pajamas and request that he go in to the bathroom to get changed and brush his teeth. Then I jump onto the computer for a little blog reading because that task takes, on average, 12 hours to complete when you are a 4 year old boy. It starts off as it always does, with the stalling and the whining…“But mommy, I can’t untie my shorts” (nevermind the fact that he had them untied and off in a hot minute earlier that day to go swimming). “Mommy, I don’t know how to take the top off the toothpaste” (wierd, he could definitely do it yesterday when he smeared it all over the sink during a fit). “But Mommy, I’m pretty sure my elbow is broken” (this one made me chuckle. “pretty sure” is his new saying). So I head upstairs, preparing my disciplinary speech with every step. I open the door to his room to see him sitting nicely in his bed with two books on his lap. Shocked, very pleased, and guilty. And that’s when it occurred to me that I’m not parenting the same boy I was 6 months ago. The pendulum has swung and the good far far outweighs the bad. Man, I love that kid. We had a visit to the nursing home to see my grandmother on the agenda for Saturday. I was a little apprehensive about it since Sprout can be anxious around new people and situations. And lets face it, a nursing home can be a scary place for children. Well, not this guy. Within 5 minutes he was hamming it up, bringing smiles to the faces of the most sad and solemn residents. 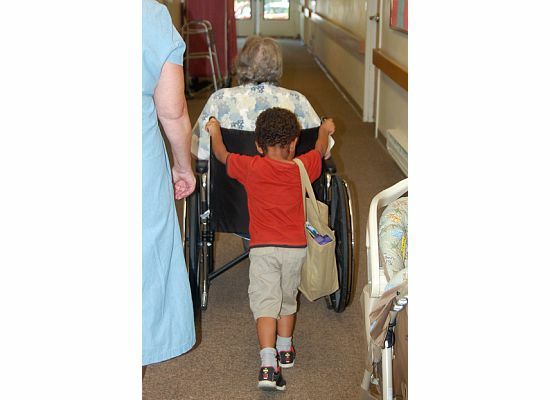 He even insisted on helping to push grandma wherever she needed to go. I become a better person every day I know him. Not to be outdone, Rosebud showed off a new trick this weekend. We are in t.r.o.u.b.l.e. with this one. As a parent, there are certain things your kids do that make you so proud and excited you just want to tell everyone you see about it. Including your local star.bucks barista, who really couldn’t care less because she’s 21 years old and hung over, but you tell her anyway and pat yourself on the back for not jumping up and down while doing so. Well friends, today is one of those days because this morning Rosebud pooped on the potty! Now I’m not saying she’s potty trained at 8 months or anything crazy like that, but I’m psyched that she’s got the association. Yay baby girl!! Sprout hasn’t figured out yet that the baby monitor doesn’t go both ways. And that’s just fine by me. No matter what else has happened during the day, in that moment everything is right and everything is okay. I’m in awe of what a wonderful brother he is.